The maverick of over-the-top martial arts anime. Kenshiro paved the way for the upstarts of today. How it basically manages to convey stronger emotion than today's dime-a-dozen action shonens despite obviously not matching the standards of modern production values speaks volumes. Ichigos come and go, but Ken will influence posterity for generations yet to come. After the nuclear apocalypse of 199X, Kenshiro begins his quest to rid the world of evil & bring hope to humanity. 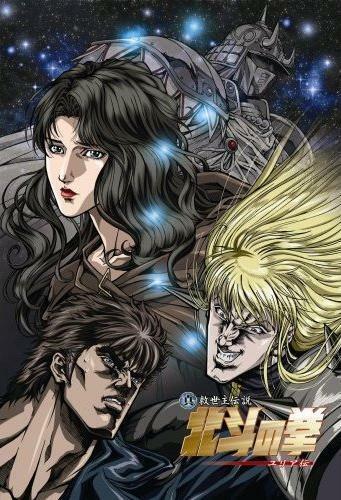 Initially, North Star begins as a revenge tale where Kenshiro is searching for his fiancé Yuria whose been kidnapped by his rival Shin. Afterwards the story then focuses on Kenshiro's destiny to bring back peace to this "age of power" where humanity have become savage & desensitized to love & affection. Essentially, most humans are now primitive causing murders for the sake of resources such as food. Only those with power, ambition & a cold heart can survive this wasteland. As a savior to the masses, Kenshiro battles many tyrannical martial artists with his assassination art of "Hokuto Shinken" causing his enemies to explode. Further in the series is where Kenshiro's battles his eldest brother Raoh giving a satisfying ending to the series. Kenshiro as a hero is almost one of a kind as he features a stoic yet kind attitude who faces tragedy on a constant basis. Bearing humanity's existence on his back, Kenshiro gives his all to protect the innocent & punish the guilty. When people think of "MANIME", this series started it all & owns up to its reputation. While the animation is obviously dated, there's no greater adaptation than this version as it portrays the sorrow & various "MANLY TEARS" moments with the greatest execution in voice acting & music. In North Star, it may not follow the typical shonen tropes of today & can be very slow at times (especially its 1st 22 eps) but manages to display character in a very tragic form. Expect to see many great men & heroes to sacrifice themselves for the sake of peace as their battles will take residence in your soul. Also it might make a MANLY MAN out of you. If you enjoy series like Jojo's Bizarre Adventure & Toriko, this is the show for you. This anime is my all time favorite but may not appeal to everyone. It certainly is a required taste to truly be appreciative of all its concepts on how masculinity & love for a woman play a part to make a society peaceful again. Expect some episodes to be slow & major fights to be done in 3-4 episodes as Fist is manliness in its purest form. Representing themes of 80's shonen, Fist Of The North Star still stands tall as a source of inspiration for all things MANLY. How often does that ever happen? Loads of memorable gimmicky villains receiving poetic justice from the knuckles of the protagonist. The intros are all top notch and the atmosphere is pure 80s perfection. Plenty of hilarity in the post apocalyptic world of inexplicable gigantism. As for the serious parts, manly tears will be shed. Fist of the North Star, aka, Hokuto no Ken, is an amazing anime that transcends time. It is still as great as it was decades ago when it originally aired. A classic story that any anime lover should watch! It somehow manages to be the most manly show ever made, and yet have it's core message be about love. And it works perfectly.